Bringing a new baby into the family can be challenging at the best of times, both physically and emotionally. It is natural for new parents to experience mood swings, feeling joyful one minute and depressed the next. These feelings are sometimes known as the baby blues, and often go away soon after birth. However, some parents may experience a deep and ongoing depression that lasts much longer. This is called postpartum depression. Postpartum depression is depression that may start during pregnancy or at any time up to a year after the birth of a child. Depression is a mental illness that affects a persons moodthe way a person feels. Mood impacts the way people think about themselves, relate to others, and interact with the world around them. This is more than a bad day or feeling blue. Without supports and treatment, depression can last for a long time. Signs of depression include feeling sad, worthless, hopeless, guilty, or anxious a lot of the time. Some feel irritable or angry. People lose interest in things they used to enjoy and may withdraw from others. Depression can make it hard to focus on tasks and remember information. It can be hard to concentrate, learn new things, or make decisions. Depression can change the way people eat and sleep, and many people experience physical health problems. A mother or father with postpartum depression may not enjoy the baby and have frequent thoughts that theyre a bad parent. They may also have scary thoughts around harming themselves or their baby. Although its rare for a parent to make plans to act on these thoughts, this situation is serious and requires urgent medical care. If you believe that a loved one is in danger, dont hesitate to call 911 or your local crisis line. Postpartum depression can affect anyone. Although its more commonly reported by mothers, it can affect any new parentsboth moms and dadsand it can affect parents who adopt. Postpartum depression is likely caused by many different factors that work together, including family history, biology, personality, life experiences, and the environment (especially sleep deprivation). Postpartum depression can be a very difficult experience. Becoming a new parent is hard enoughand the challenges added by depression can seem overwhelming. Its important to remember that there is no such thing as a perfect pregnancy, perfect birth, perfect baby, or perfect parent. You are doing the best you can. And with care and support, you can recover and enjoy time with your family. A type of counselling called cognitive-behavioural therapy is a common treatment for postpartum depression. It may be the first treatment to try for mild or moderate symptoms. Cognitive-behavioural therapy teaches you how your thoughts, feelings, and behaviours work together. It also teaches important skills like problem-solving, realistic thinking, stress management, and relaxation. Another type of counselling called interpersonal psychotherapy may also help. It focuses on relationships and can help people adjust to changing roles in their relationships. Support groups are also very important. Postpartum depression and new parenthood can both isolate you from others, and isolation can add to feelings of depression. Support groups are a safe place to share your experiences, learn from others, and connect with other parents who have similar experiences and understand what youre going through. Taking care of your well-being is especially important, but this can be difficult for any new parent. It may be helpful to recruit loved ones or see what services may be available so you can take some time for your own needs. Regular exercise can boost your mood and help you manage stress. Eating well and sleeping as much as you can are also very helpful. And its always important to spend time on activities you enjoy, find relaxation strategies that work for you, and spend time with people who make you feel good. Medications called antidepressants are used to treat depression. There are many different classes and types of antidepressants, and each work a little differently. While many moms can safely use antidepressants while breastfeeding, its important to talk with your doctor about the possible risks and benefits. Medication can help with some symptoms, including sleep, appetite, and energy levels. However, medication cant get rid of some of the thoughts or beliefs that can fuel depression. Its usually best to include counselling if you are taking an antidepressant medication. Postpartum depression can be a difficult experience for everyone. Most people expect the arrival of a child to be happy and joyful, and postpartum depression is none of those things. Its important to know that postpartum depression is no ones fault, but you can play a big role in a loved ones recovery. Make sure your own expectations of your loved ones experiences and day-to-day abilities are realistic. Remember that every parent and child is unique and its not useful to compare two people or two families. Understand that people who experience postpartum depression may want to spend a lot of time alone. This can hurt, but try to remember that it isnt about you. They are simply trying to cope with an illness. Offer help with daily responsibilities. Its hard enough at the best of times to find time for daily chores when theres a new baby. Often, offers of help from friends and neighbours are strong in the first month or two, but may be needed just as much, or more, in later months. Help with child care (including overnight help for feedings), or help finding a child care provider. A short break or a chance to get back into interests can make a big difference in anyones well-being. It can also create more opportunities for sleep. Managing postpartum depression can take a lot of hard work. Recognize a loved ones efforts regardless of the outcome. Talk to your doctor or public health nurse, or accompany your loved one on appointments, if youre concerned. Seek support for yourself, if needed. Support groups for loved ones can be a great resource and a great way to connect with others. 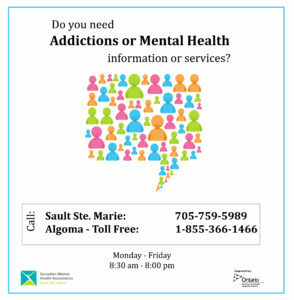 Contact a community organization like the Canadian Mental Health Association to learn more about support and resources in your area. Founded in 1918, The Canadian Mental Health Association (CMHA) is a national charity that helps maintain and improve mental health for all Canadians. As the nation-wide leader and champion for mental health, CMHA helps people access the community resources they need to build resilience and support recovery from mental illness.